Looks like I’m in the market for a couple of dead cats for my stick mics. Now, on a minor technical point, stuffing your 416 or CS-1 in a dead cat when indoors is a technical faux-pas. An audio tautology. When you see it happen, you think ‘Film Students’, or a gauche attempt to appear ‘Pro’. Whilst we can discuss the use of a Sennheiser 416 indoors over more suitable short shotgun microphones on one hand, and chuckle at the sort of gut reactions above on the other, I’m a bit shamed to be honest. I’ve never really thought of the situation from the voxpopper’s position – specifically, someone who isn’t used to the gear we use. We call them ‘gun’ mics, ‘rifle’ mics, it’s all a bit wrapped in that male viewpoint, and when somebody pokes something ever so slightly alien at you, resplendent in its anodised smooth black metal, it can be… well, intimidating. It can also be confusing. I didn’t have a ‘reporter mic’ with me when we suddenly had a need to do a ‘friendly chat’ between three people, so the participants (to some degree media trained) took my short shotgun Sanken CS1 (crumbs, here we go again) and used it like more like a vocalist’s mic (close to the mouth), to a degree where the mic was dealing with uncomfortably loud source material (never mind the audio circuits in the camera). The next participant would take over and use the mic at the correct distance for a reporter mic. Lots of scrabbling with audio levels, application of limiter in camera and compression in post rescued the shoot. But I digress. The learning point from that is that, given a mic, media-trained folk will tend to shove reporter mics in people’s faces (including their own) ‘just like on TV’. But there is a sort of mic they KNOW should be wafted out of shot – that’s right, the big fluffy ones. You really can’t stuff that in somebody’s face. So, here’s the deal. 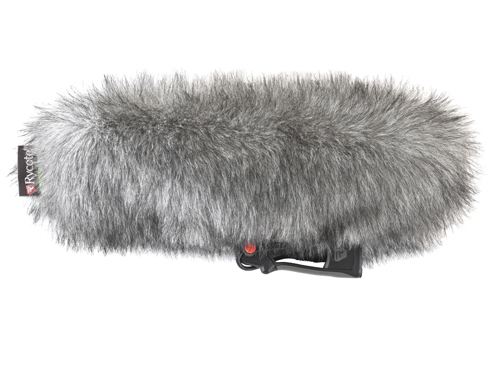 I will get a ‘Dead Cat’ windjammer for my hypercardiod (okay, short shotgun) mics when doing voxpops and accept a little less from them. Yes, it’s funny and unnecessary and to techie crews, ‘poserish’ – but it’s also funny for the interviewee, and that relaxes them. And they’ll keep the mics away from their face. So roll on the Dead Cats.